They were met with resistance by some 4,000 counter-protestors, who blocked off the National Front as they passed through New Cross, forcing the police to reroute them. 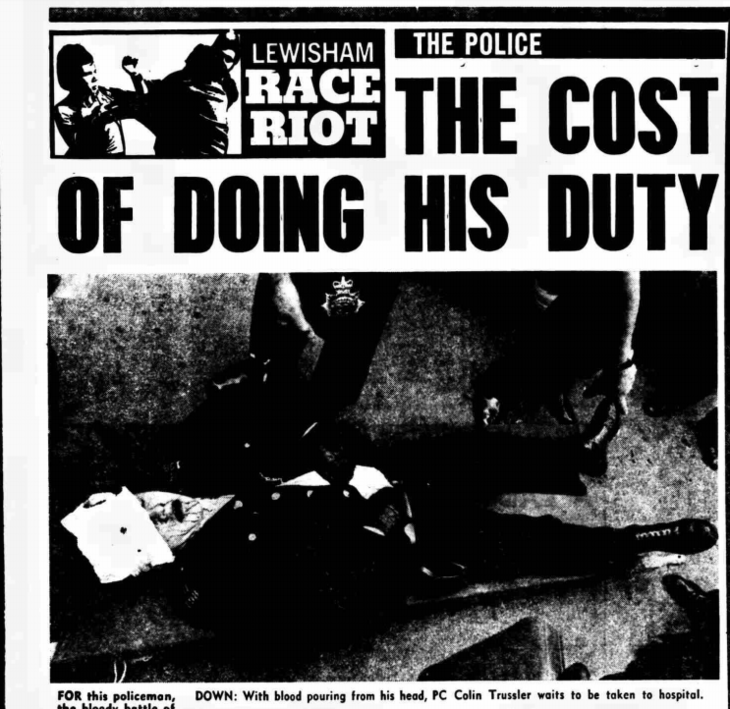 Later, there were bloody clashes in Lewisham town centre between police, and the counter-demonstrators. It was a dark day for London, as 11 policemen were hospitalised, and 214 people were arrested. Riot shields were deployed for the first time on the British mainland, soon to become an icon of the tumultuous 1980s. The All Lewisham Campaign Against Racism and Fascism (ALCARAF) had appealed for the National Front's march to be nixed altogether. The appeal was ignored by the Met Police. Dark too, was some of the coverage that the riots received; blame sometimes apportioned to the anti-fascists, as much as the National Front. Still, the protestors had succeeded in stopping the racists from reaching their destination. Now, the 'Battle of Lewisham' will be remembered with a mural depicting the demonstrators and community leaders who put their safety on the line, to stand up to hatred. The bright and ballsy design — created by Goldsmiths graduate Ted Low in collaboration with a community advisory group — features splashes of bright pink, yellow, green and red in a reference to 1970s reggae and anti-fascist punk culture, as well as smoke bombs used during protests. The original images were taken by some of the most prominent social documentary photographers of the time, including Chris Schwarz, Syd Shelton, Paul Trevor, Chris Steele-Perkins, Peter Marlow and Homer Sykes. The artwork — which has echoes of the East End's Battle of Cable Street mural — will be located in the park on Batavia Road, off Clifton Rise in New Cross, close to where the anti-fascists first congregated. It's expected to be unveiled in late 2019. Locals are now being asked to have their say on the mural's provisional design. Currently, the Battle of Lewisham is remembered in New Cross with a red plaque.